A Family Tradition for 225 Years. Hey Greenlawn, it’s a pop-up sale! We have ten, count ’em, ten pre-cut trees remaining and we want them to find their holiday homes this week. There’s both Concolors and Frasers available, first come first serve. $40 cash – that leaves you with plenty left to get some cool presents to go beneath your new tree! 😎 If you still need a tree, call Bruce at 631-495-5876 to arrange pickup between now and Saturday 12/15. This entry was posted in Uncategorized on December 12, 2018 by TLF. We are now closed for the 2018 season. Thank you to everyone who chose us for their Christmas Tree this year. It’s an honor and a joy for us to be a part of your family’s celebrations, and we look forward to returning next year to help you continue your family traditions. From our family to yours, we wish you a wonderful holiday season and all the best in 2019. Merry Christmas! This entry was posted in Uncategorized on December 9, 2018 by TLF. 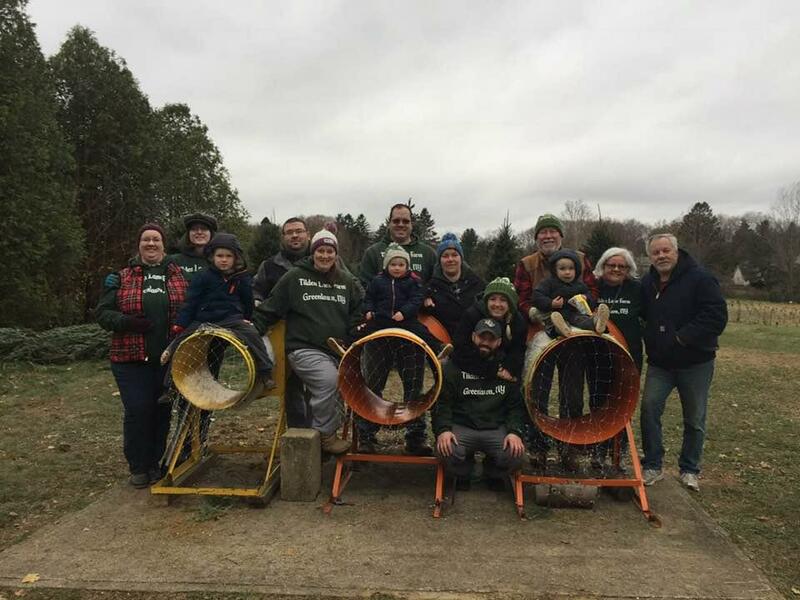 While the sounds of the Fireman’s Fair echo through Greenlawn and students are packing up their backpacks for a new school year, we’re getting the farm ready for another holiday season. Our hours are 9 am to 3 pm, and remember to wear sturdy shoes and dress for the weather on the day of your visit. 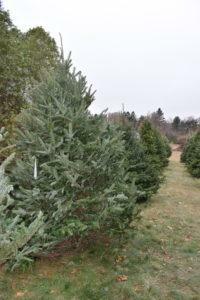 We will have both pre-cut and cut-your-own trees available. If you wish to select and cut your own tree we highly recommend you visit the farm during our first weekend of operation. Our stock of cut-your-own trees will be limited this year; we will also have plenty of freshly cut trees available for you to choose from. We will be crafting our hand-made wreaths and will have a kids craft available as well. We can’t wait to welcome everyone back to the farm! This entry was posted in Uncategorized on September 3, 2018 by TLF. Over Memorial Day Weekend we transplanted several hundred baby trees to prepare for future seasons! Right now these baby trees are only as tall as Logan but in four or five years they will be just right for Christmas trees. This entry was posted in Uncategorized on May 27, 2015 by TLF. 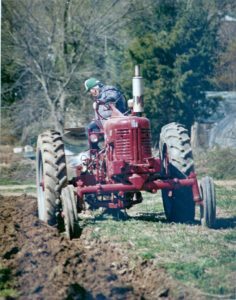 As many of our friends and neighbors have heard, in early November Herbert S. Tilden died at the age of 92 at his home on the farm, surrounded by his family. We look forward to honoring his memory this season. 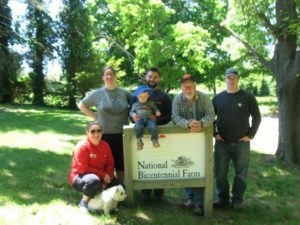 In addition to his lifelong work as a farmer, with his wife of 50 years, Mable Flathmann Tilden, at his side, he raised five sons- the late Jeffrey (Ann), Bruce (Jeanne), Lee (Diane), Donald (Cyndy), and John (Christine). He was the proud grandfather of Abigail, Rebecca (Mike), Andrew, Emily (Jon), Daniel,and David, and great-grandfather of Logan. Following in his own father’s footsteps, Herb was a 68 year member of the Greenlawn Volunteer Fire Department. He also served four terms as a Commissioner of the Greenlawn Fire District. Herb was instrumental in the founding of the ambulance service of the GFD Rescue Squad in 1961. 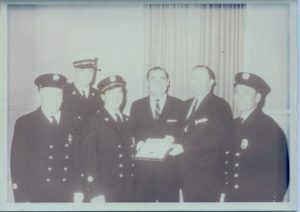 He is shown below (far left) with fellow Squad members receiving an award in 1964 for a rescue where a car accident victim with a broken neck was safely extricated and transported without further injury or paralysis. His sons Bruce and Lee, and Lee’s wife Diane, are proud to carry on the family tradition of GFD service for the third generation. 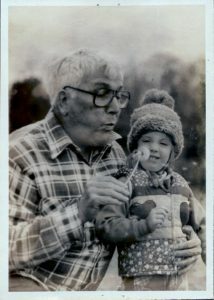 Like dandelion seeds in the wind, our memories of a life well lived will always surround us. This entry was posted in Uncategorized on November 29, 2014 by TLF. Commercial photography and photoshoots, including the use of tripods, external lighting, or props, are not permitted on the farm. Thanks for your understanding! Copyright Tilden Lane Farm 2016. Thank you to Mellonia Photography for providing some of the images on this site.